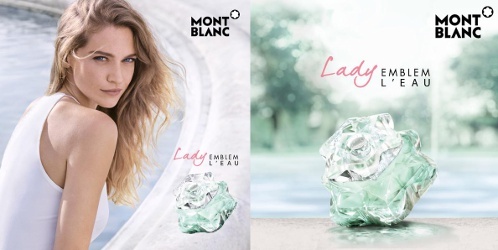 Montblanc has launched Lady Emblem L’Eau, a new fragrance for women. Lady Emblem L’Eau is a flanker to 2015's Lady Emblem, and follows 2016's Lady Emblem Elixir. She is independent, self-confident and magnetic. She also knows when to slow down and take a break in a park, get some fresh air between appointments, and take time for herself. It is then that her irresistible, candid femininity appears. The Montblanc woman is the embodiment of timeless beauty in a world in constant motion. Her innate sense of style shines through in every move she makes. She is unique, like the Montblanc diamond. The pastel green juice of Montblanc Lady Emblem L’Eau was inspired by a summer garden, “an allegory of a poetic walk in the summertime through a garden of citrus trees and fresh roses,” confides [perfumer] Sonia Constant, who created the fragrance. This exquisite, meandering olfactory stroll begins with fruity accents: mandarin leaf, and the aquatic-sweet notes of white peach and exotic lychee. In the middle notes, a voluptuous bouquet of roses, the ever-present scent guiding the success story of Lady Emblem, enhances the aerial florality of magnolia. Sonia Constant essentially captured the green, fresher aspect of the rose to emphasize the lightness of the composition. Precious musks, elegant blonde cedar, and creamy benzoin form the base notes. It is a story of sparkling water, a lyrical floral-aquatic, for a woman as delicate as she is strong. Montblanc Lady Emblem L’Eau is available in 30, 50 and 75 ml Eau de Toilette. Unusual park, what with peach and lychee, and roses and magnolia blooming simultaneously. Struggling with the concept of femininity being ‘candid’ too. That’s why the park is allegorical? Beats me.